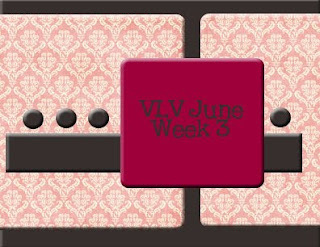 I have a little bit of catch up to do with my June Viva la Verve challenges. I still need to go back and complete week 2, but this week's sketch was calling my name. We're continuing our walk through kids' rooms this week (and the whole month of June), and Amber had some wonderful inspiring rooms for us! I loved two of the rooms, but the pink and black room eventually won me over. I stuck with the pink, black, and white theme, and even tried to mimic the stenciling on the back wall by using my large scallop punch, then tracing with a black maker. I love the uniqueness of this sketch with the off-center rounded panels in the back! Such a fun little accent! I popped of my sentiment to separate it a bit from the fun background. I have this room picked as well because I love B & W and pink cards. Love the scallops you used and the doodling on them! Looks great! Also love how you did the sentiment panel shape. Fabulous card :D Good luck with getting those report cards D-O-N-E done! !